Diabetes most commonly affects middle-aged, overweight female dogs. It is caused by a lack of insulin, a hormone that is produced by the pancreas which is essential for glucose metabolism. The pancreas becomes damaged by either inflammation or the dog’s own immune system attacking it. The result is a shortage of insulin-producing cells in the organ, which is irreversible. Consequently, diabetic dogs are very unlikely to go into remission. One of the most obvious symptoms of diabetes in dogs is increased thirst. However, there are other medical conditions that can also cause your dog to drink more than usual, such as kidney or liver disease or Cushing’s Disease. Your vet will run some tests to check for diabetes; they will look for higher than normal levels of glucose in his blood and urine. There are several possible causes for diabetes mellitus. Genetic predisposition is one likely cause, since some breeds seem to be predisposed to diabetes, and dogs that have diabetes often also have relatives with it. However, there is also thought to be a relation to hormones therapies, since dogs that are receiving drugs to control heat cycles are at a higher risk of developing diabetes. This is due to their interference with insulin production. Pancreatitis is also likely to be a factor. Some causes that are still being investigated are immune-system disorders, and there are indications that viral diseases can also lead to this condition. The prevalence of diabetes in dogs is not great; it varies between one in 400 and one in 500. Your veterinarian will take detailed medical history from you of your dog’s health leading up to the onset of symptoms and details of the exact symptoms. Standard tests will include a complete blood count, chemical profile, and urinalysis. These tests should be sufficient for diagnosis and initial treatment. Typically, with diabetes, an unusually high concentration of glucose will be found in the blood and urine. Abnormally high levels of liver enzymes and electrolytes imbalances are also common. Urine test results may also show evidence of abnormally high levels of ketone bodies – water-soluble compounds produced as aby-product of fatty acid metabolism in the liver and kidney. A numbers of other abnormalities may also be found. Your veterinarian will prescribe a course of treatment that will include daily exercise in your dog’s schedule. Lowering insulin demands and balancing your dog’s food and liquid cravings to healthy levels will be the first priority. Obesity is one of the major risk factors for diabetes, and this condition can make management of diabetes difficult, but it can only be brought under control slowly and with great care. The target weight may be reached in 2-4 months, but your veterinarian will need to suggest a practical timeline that is appropriate for your dog. If your dog has actually lost weight, you will need to work with your veterinarian on a plan to increase your dog’s weight to normal levels. Soft and moist foods will have to be avoided because they cause rapid accumulation of glucose in the body. However, do not change your dog food suddenly and without first discussing it with your veterinarian. Your dog will need a well-thought-out and strictly enforced diet plan. Your veterinarian can help you to design a plan that is well suited to your dog’s needs, with lifestyle changes to facilitate proper management of diabetes. Most patients’ diabetes can be managed without complications, but for some dogs, the situation may be more challenging. Your veterinarian will make an individual treatment and management plan for your dog based on the dog’s current disease status. Your veterinarian will also brief you on what to look for in case of either hypoglycemia (low levels of glucose) or hyperglycemia (high level of glucose), both of which can be seen in diabetic dogs. Keeping a daily and weekly chart of your dog’s diet, glucose test results, daily insulin dose, and weekly body weight is highly recommended for following patterns and recognizing when your dog deviates from it’s a regular pattern. 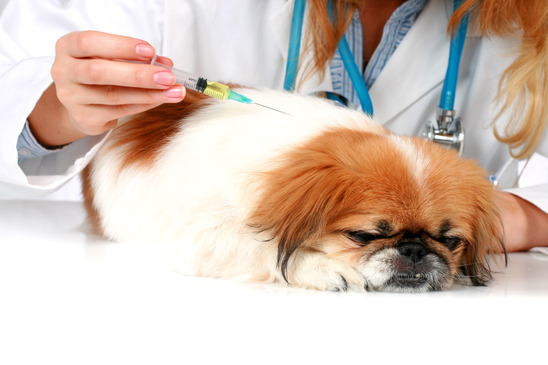 There are various types of insulin available and a selection of the type that is appropriate to your dog will make by your veterinarian. For instance, smaller dogs usually need multiple doses of insulin as part of their daily insulin therapy, while larger dogs may only need one dose per day. Likewise, doses are calculated according to the weight, age, gender and individual insulin requirements of the affected dog. Depending on how severe the diabetic condition is, and how the amount of insulin in the body variates from day to day, you may need to evaluate your dog’s blood glucose levels on a daily basis and adjust the insulin dose accordingly. If this is a serious issue, and there are no plans to breed, your veterinarian will recommend a hysterectomy for your female dog. This is to avoid the surge of hormones at the time of estrus, which can further complicate your dog’s health. Unfortunately, this is not a disease that will be cured, but your dog’s health can be kept stable and it can go on to live a fully enjoyable life. This will be dependent on your willingness to adhere to your doctor’s dietary recommendations. If properly managed, diabetic patients do well and usually have normal lifespans. This occurs when his blood sugar drops too low, either because he has been given too much insulin or he hasn’t eaten all of his food. Symptoms are trembling and weakness and some dogs even have seizures. Emergency treatment is to rub some glucose syrup or honey on his gums, which will quickly increase his blood glucose. Most dogs quickly recover after this, but it’s still worth having them checked by your vet. Insufficient insulin will lead to your dog metabolising his body fat to provide energy. The by-products of this metabolism are chemicals called ketone bodies. They have a distinctive odour, like nail polish remover. Affected dogs are lethargic, vomiting and off their food. Diabetic ketoacidosis often occurs before your dog is diagnosed with diabetes because their pancreas isn’t producing enough insulin, but it can also happen if his diabetes isn’t well managed and his insulin dose is too low. This is a real emergency and your dog needs urgent veterinary treatment.